Is the atlatl fun?! We have to give a resounding yes to that after seeing hundreds of people use an atlatl for the first time. Some people are so captivated they keep coming back to try it again and again. Who says atlatls are fun? We do. It is fun for us at the Thunderbird Atlatl shop to see stories in magazines, newspapers, and on local radio and television productions about people having fun with our atlatls and darts. 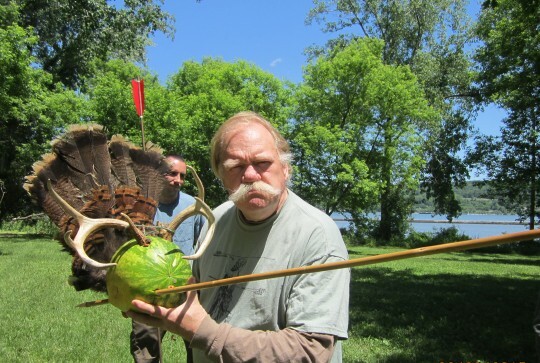 Thunderbird Atlatl is proud of being one of the creators of the modern atlatl resurgence. Our atlatl and darts are used by groups throughout the United States. Internationally, we have sent atlatls and darts to countries all over the world. This week in Michigan, the Cranbrook Institute of Science had a night camp and Thunderbird’s atlatls and darts were part of the program. It looks like they are using our Nanticoke Atlatl in the picture associated with the article. 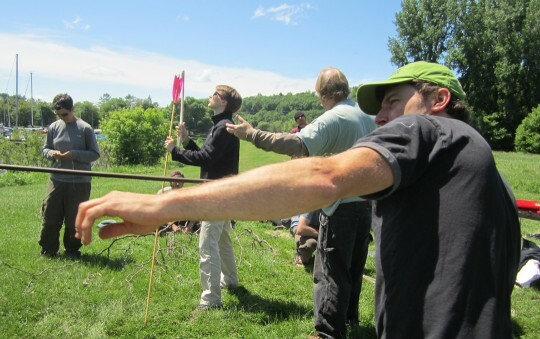 A few weeks ago, Bob Berg of Thunderbird Atlatl shared atlatl fun with groups at the Primitive Pursuits program in Ithaca, NY. The first photo in this article and photos below are people having fun with atlatls and darts. The group made expedient atlatls from natural resources nearby and also put together a few of Thunderbird Atlatl’s popular atlatl and dart kits. They also used the atlatl to vanquish neaby predators. They learned how to make an atlatl and dart during the workshop. Atlatl Fun with an expedient atlatl made from surrounding natural materials. Participants at Primitive Pursuits in Ithaca having atlatl fun with a finished Catatonk Hunter Atlatl and an expedient atlatl. 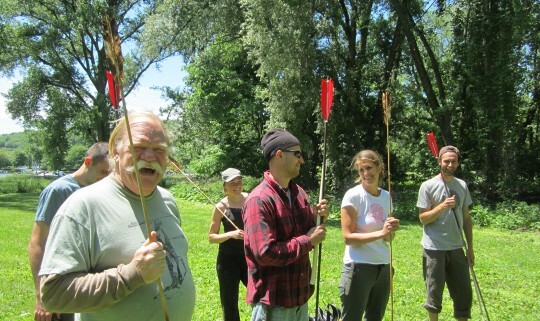 Bob Berg of Thunderbird Atlatl (center) leads the fun. 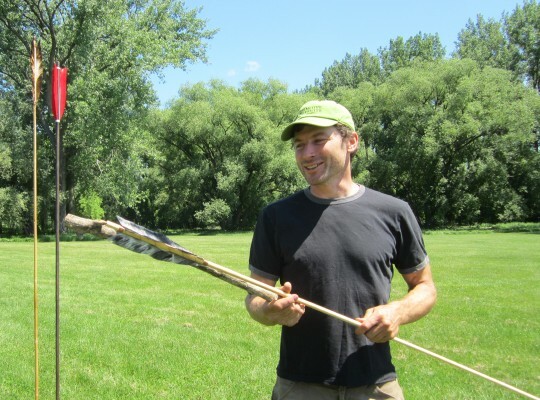 Thunderbird Atlatl Bob Berg shows how an atlatl and dart can handle predators. The Primitive Pursuit class helped capture this predator.